Dr. Robert Teagle Sr of Teagle Optometry is a father who had the pleasure of watching his sons follow him into his chosen profession. Robert, Jr. and brother Don not only followed the same career path, but also joined their father in his business. 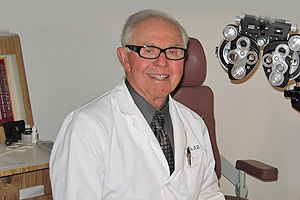 Dr. Teagle, who practiced optometry since 1949, saw the profession go through a number of changes. Having his sons join him enhanced the business by bringing knowledge of new technology with traditional treatment and lifelong experience. Dr. Teagle said he liked having his sons in the office when they were young. From about the age of 14 he allowed his sons to work in his office on weekends and during summer vacations. "Through the years there was a lot of work and I thought it would be great to have the boys join me," he said. With his parents working in the office, there was a time when there were three generations of Teagles on staff. "We had a lot of fun," he said, as he recalled those days. As Dr. Teagle's practice grew, the field of optometry was experiencing growth brought about by new technology. With advances in contact lenses, glaucoma screening and materials used to manufacture eye glasses, the business became much more diverse. Having his sons join him after graduating from college enhanced Dr. Teagle's practice. He referred to his education as an example of changes that have taken place in recent years. Dr. Teagle, who graduated from Pomona College, said he was required to complete two years of college and two years of optometry school. His sons had to complete four years of college and four years of optometry school. Robert, Jr. and Don have brought their extended schooling with working knowledge of advanced technology to their father's practice. As an optometrist's role changed from being only an eye glass dispenser to a practitioner who treats infections, removes foreign objects from eyes and renders physical treatment, continuing education has become a requirement for license renewal. Along with the need for continuing education brought about by technological advances, other changes stemmed from the growing presence of HMOs according to Robert, Jr. With many plans, the optometrist is the first eye doctor a patient sees before being referred to an ophthalmologist. "We have greater access, longer hours and we're more cost-effective," he said. With the availability of new computerized diagnostic equipment and the training necessary to use it, Teagle Optometry shares a commitment, built upon a foundation of learning and a sharing of knowledge, to provide all patients with the best possible care. Sadly, Dr. Robert Teagle, Sr. Passed away on July 1, 2016 in Valencia Ca. Click HERE to view memorial tribute.